Collins Booksellers - “Tired all the Time” by Marie Thomas, 9783319939131. Buy this book online. This book explores the history, effects, diagnosis and treatment of chronic fatigue as well its significant links to other illnesses. Fatigue is a difficult symptom to accurately assess and quantify due to its subjective nature. 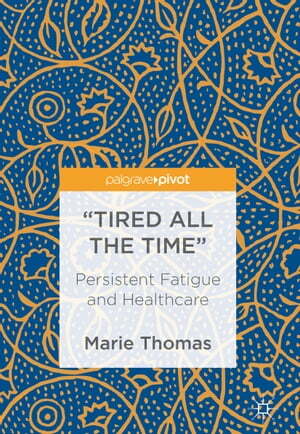 Marie Thomas discusses the uncertainties and difficulties in its diagnosis as well as the broader effects of fatigue on quality of life. Fatigue is an increasingly reported problem in primary care, and one that is associated with other chronic conditions as a secondary symptom. Using several case studies, this book describes how in many cases, a patient’s primary condition can be managed; however General Practitioners are left unable to address the fatigue experienced, especially in older adults. Chapters consider the interventions that exist to manage fatigue – especially in the case of Chronic Fatigue Syndrome (CFS) – before highlighting the lack of strategies in primary care for dealing with the problem. In the final chapter Thomas discusses potential interventions and gives recommendations for future research regarding fatigue. This book will be of interest to academics and practitioners in healthcare and psychology, as well as to patient groups and those who care for individuals with fatigue.